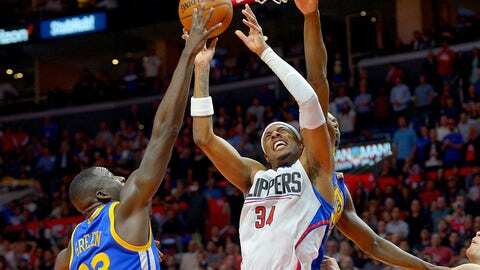 Nov 19, 2015; Los Angeles, CA, USA; Golden State Warriors forward Draymond Green (23) blocks a shot by Los Angeles Clippers forward Paul Pierce (34) in the second half of the game at Staples Center. The Warriors won 124-117. OAKLAND, Calif. (AP) — Warriors forward Draymond Green has been caught on microphone taunting the Clippers’ Paul Pierce about his impending retirement. Pierce is in his 19th NBA season and said in September this will be his last one. TNT microphones caught Green slamming Pierce early in the Warriors’ 123-113 victory over Los Angeles. Pierce later shot back on Twitter , poking fun at the Warriors’ loss to the Cavaliers last year in an NBA finals Golden State once led three games to one. Green also criticized Pierce in October for his criticism of Kevin Durant’s move to Golden State as a free agent.